The key to health, wealth, and saving the planet: learn to love leftovers! Until I began my fitness training and nutrition coaching business five years ago, I had no idea how many people refuse to eat leftovers. This blows my mind because as a society we are strapped for time and money, our health is failing, and we’re slowly but surely destroying our planet. Learning to love leftovers can help to solve all of those problems! We need to show our leftovers some LOVE! Why don’t we love leftovers? Americans waste a staggering amount of food. It is estimated that a whopping 40% of the food Americans purchase is thrown in the trash. How much do you spend weekly on food? If you’re not eating leftovers, just take about half of that money and throw it in the garbage…or send it to me. Leftovers represent precious time and hard-earned money that you’ve already spent…so why are we letting them go to waste?!? Throwing away food is the same as throwing away money. I actually love leftovers. Leftovers make my life simple, keep me out of the fast food drive thru, and they’re tasty! Leftovers also help me avoid overeating! How? I used to be a part of the “clean plate club” because I “hate wasting food”. But food can also be wasted on your waistline. It’s easier for me to stop eating and leave food on my plate because I know it’s not going into the garbage! I really can’t say enough about leftovers…they’re great! So I had to figure out this conundrum: why aren’t other people using and loving their leftovers too? Turns out most people are just doing it wrong. I agree that slapping some grayish-brown meat and soggy vegetables on a plate and then microwaving it isn’t exactly appealing. I’d be tossing my leftovers in the trash and ordering a pizza too. You’ll save the planet. We all need to do our part to create less waste and greenhouse gases. Learning to love leftovers is a great place to start. You’ll be healthier and slimmer. Eating restaurant or fast food is just a fast way to get fat and wreck your health. Captain obvious! When you control the ingredients, you control your health. Learning to love leftovers will help you eat at home more often. You’ll have more time. Cooking from scratch definitely takes time…but utilizing leftovers to cook new and exciting dishes takes almost NO time! If I have leftovers I can whip up a new dish in less than 20 minutes. Soccer nights are no longer McDonald’s drive thru nights! You’ll save money…like a lot of money. For more ways to save, plus tips on storing leftovers and making them taste good, check out this blog post by my friend and financial coach Amanda Sharratt! 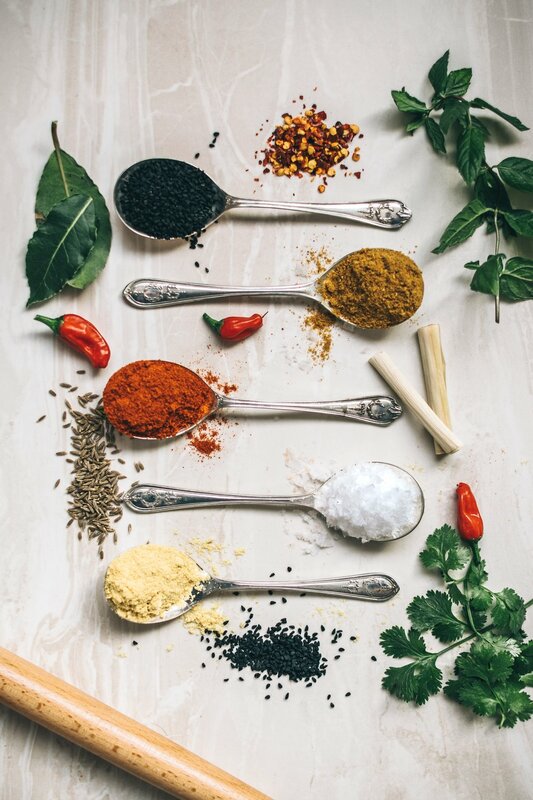 Spices and herbs add both flavor and visual appeal! But my family hates leftovers! How do we learn to love leftovers?!? Repurpose leftovers the right way. We want to eat food that tastes good! So make your leftovers taste great! Leftover meatballs can be broken up and turned into a wonderful Bolognese sauce. Greens and leftover cooked veggies can be made into a fine vegetable soup or a quick stir fry. Leftover veggies and meats can be turned into an easy egg frittata. Leftover meat can easily be made into tacos or quesadillas. Try mixing leftovers into your morning eggs. Utilize spices, seasonings, hot sauces, and mustards to change the flavors. There are so many options! Make it look nice. The visual aspect of food is nearly as important as the taste. Brightly colored herbs, veggies, hot sauces and mustards will add both flavor and visual appeal! Start with a “base protein” and cook a boatload of it. If you make chicken paprikash it’s going to be hard to repurpose that into a different meal because the spices in that dish are pretty prominent. In other words it would be hard to make chicken tacos from leftover chicken paprikash. But it’s pretty easy to make multiple different dishes from unseasoned pre-cooked meat. So, for example, on Sunday I may toss five pounds of lightly seasoned chicken on the grill and we’ll have grilled chicken dinner on Sunday night, chicken paprikash on Monday, chicken tacos on Tuesday, and chicken salad sandwiches on Wednesday. If there’s any chicken left by Thursday, I usually throw it in a soup. This saves me loads of time and I serve a “new” dish every night. Modify recipes to use what you have on hand! Most recipes can easily be modified to use leftovers and different kinds of meats, vegetables, and starches. For example, I can make a stir fry with virtually any pre-cooked meat: chicken, pork, beef, or even ground meat. I also switch up the veggies I use in my dishes. Just because the stir fry recipe calls for carrots and bamboo shoots doesn’t mean I have to use them! One week I might make a broccoli and cauliflower stir fry, and the next I might use Brussels sprouts and snow peas. Variety is the spice of life ans also key to health! Learn which recipes actually taste better the next day. Spaghetti sauces, soups, salsa, chili, and stews all taste better the next day because the spices and flavors have had time to marinate! These make great lunches the following day. When I make something that I know will taste better the next day, I often double or even triple the recipe and freeze for later use. Cook once, eat many times! Have a leftovers night. If the leftovers are piling up in your fridge, dedicate one night of the week to eating them. This is actually my family’s favorite dinner of the week…but we don’t call it leftovers night! It’s “snacky night”. I set all of the leftovers on the counter and everyone can choose what they want, in whatever combination they want it! Don’t tell them. Do you get moans and groans when you announce “we’re having leftovers for dinner”? Start thinking of leftovers as ingredients…and don’t announce that you’re having leftovers because you’re not! You are making an entirely new dish every night! Have fun and be adventurous! Buon appetito! Take The 5-day Love Leftovers Challenge! I love leftovers for so many reasons, but mostly because I know how to re-purpose them so they are different and delicious every time! I challenge you to take the 5-Day Love Leftovers Challenge! You will save time and money and ensure a healthier family and planet! On Sunday cook enough of your favorite protein to last you until Thursday. For my family of three, I usually buy between four and six pounds of meat. This ensures we’ll have enough for dinners all the way through Thursday, and typically yields enough for breakfasts and/or lunches too. You could use chicken, turkey, pork, beef, wild game, or ground meat. I’m using lean ground beef mixed with lean ground turkey in the 5-Day Love Leftovers Challenge example below. Make the burger patties for grilling and set them aside. Then cook the rest of the ground beef/turkey mixture in a large pan on the stove. Lightly season the ground beef as it cooks with a little bit of salt and pepper if desired. When the ground meat in the pan is fully cooked, store it in a large (or several smaller) air-tight container in the fridge. Toss the burgers on the grill and set out buns and fun burger toppings like cheese, tomato, leafy greens, olives, pickles, mayo, ketchup, and mustard. Serve with a side salad or sliced fruit for added nutrition. Monday Night: Easy Peasy Korean Beef, Veggies, and Rice! This dish is so flavorful! I usually make enough so I can have leftovers for lunch on Tuesday! Recipe is below! Who doesn’t love a good taco?!? It’s so easy to use leftovers to make delicious and gorgeous new dishes! Who doesn’t love taco night?!? This dinner is a cinch with pre-cooked meat! Heat and lightly oil a pan, then add the meat to warm it up. While the meat is heating on the stove, season it with taco spices and use it for tacos, enchiladas, or quesadillas. Wednesday Night: Buon Appetito Bolognese! I love saying the word Bolognese…and it makes this dish sound exotic and exciting. It’s spaghetti sauce. Add a generous amount of the leftover ground meat to your own homemade sauce or a jarred sauce and heat on the stove. Serve with crusty bread or pasta. Want it healthier? Serve over spaghetti or zucchini “noodles”. Toss all appropriate leftovers into a soup! Leftover meat, veggies, pasta, and rice can all easily be turned into a hearty and healthy soup! Simply choose any soup recipe that utilizes ground meat…and eliminate the part where you have to cook the ground meat because yours is already cooked! Serve soup with crusty bread warmed in the oven (maybe left over from last night’s Bolognese) or grilled cheese sandwiches. Bonus Night! Friday Night Pizza Night! My daughter loves homemade pizza night because she gets to help. I set out all the topping ingredients and we each make our own individual pizzas! Use tortillas you have left over from Taco Tuesday for the “crust”, and sauce left over from the Bolognese to make homemade pizzas. Spread sauce onto the tortillas, add cheese, extra ground beef crumbles, and any other toppings you desire. Put the pizzas on an oven-safe tray and bake them in a pre-heated oven until the cheese is melted. If you’ve reached Friday or Saturday and you still have leftover meat, you might be OVER IT! I get it! Feed it to the dog, or toss it and learn to make a little less the next time you bulk cook. One of my favorite ways to use leftover ground meat: Easy Peasy Korean Beef and Veggies! If the veggies are fresh, you’ll need to cook them for a few minutes. Add a few tablespoons of water to a large skillet. Heat until the water is about to boil (should take less than a minute). Add the veggies and cover. Cook until tender-crisp, about 3 minutes. Remove veggies from the skillet and set aside. If the veggies are leftovers from another meal, heat them up quickly by putting them into a microwave-safe container and nuking them for a minute or two. Don’t overcook the veggies! Now add the ground meat to the skillet with a couple of tablespoons of water. Heat over medium-high heat until meat is warmed through. Because the meat is already cooked, this step should only take a minute or two. Add in the veggies*** and cover. Allow to cook for a few more minutes until veggies are warmed. ***Recipe notes: The sauce may be a bit watery. If you like a thicker sauce, use some corn starch or arrowroot powder to thicken. This recipe works best with vegetables that stand up well to heat and have not been overcooked. Brussels sprouts, green beans, asparagus, broccoli, cauliflower, carrots, snow peas, and bell peppers work great. You don’t have to add the veggies to the ground meat either! I frequently heat the veggies separately and serve them on the side. Happy Thanksgiving! Remember to give thanks and love those leftovers! Thanksgiving is THIS WEEK! The days after are the perfect time to take the 5-Day Love Leftovers Challenge! Thanks for reading! Don’t forget to head over to Amanda’s blog post for more great tips on storing and using leftovers! Did you take the 5-Day Love Leftovers Challenge? How Do I Avoid Holiday Weight Gain + SPECIAL COURSE GIVEAWAY!